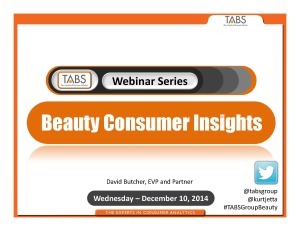 TABS Group Founder and CEO, Dr. Kurt Jetta, presented Part II of our 2014 Beauty Consumer Insights study on our webinar with Drug Store News yesterday. We would like to thank everyone who participated in the webinar, and for the great questions that were sent in. 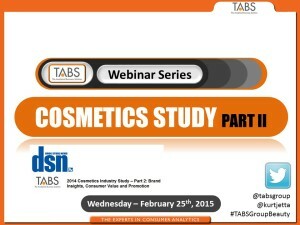 Today TABS Group presented the highlights of our 2014 Beauty Consumer Insights study on our webinar with Drug Store News. In the 2nd Annual Consumer Value Study for Consumables, TABS Group looks at how shopping behavior and attitudes have changed vs. last year with respect to consumer’s use of promotional offers. Further we analyze how these promotional search behaviors affect their choices of outlets including Walmart, Target, Walgreen’s, Costco, etc.. Other areas covered are quantifying the size of previously hard-to-track channels such as Natural Food and Online purchasing.